Our Rustica Coppa is a truly delicious product aged under carefully controlled conditions in the "old world style." Originally produced in Northern Italy, it is naturally dry cured and should be sliced thin to release its savory flavor. Extra lean pork salami lightly seasoned with natural spices and just the right amount of garlic, then slowly air-dried. We use the same recipe that was developed by the monks of Bologna and Modena over 500 years ago. Slowly cooked at low heat to maintain its moisture and flavor. Yes, ours includes those wonderful Pistachio nuts! Made with pork, beef and special spices then cured 3 months to perfection. This old fashioned air dried sausage, not the so called “cooked pizza topping". One of the original salamis created hundreds of years ago in the farm houses of Italy. 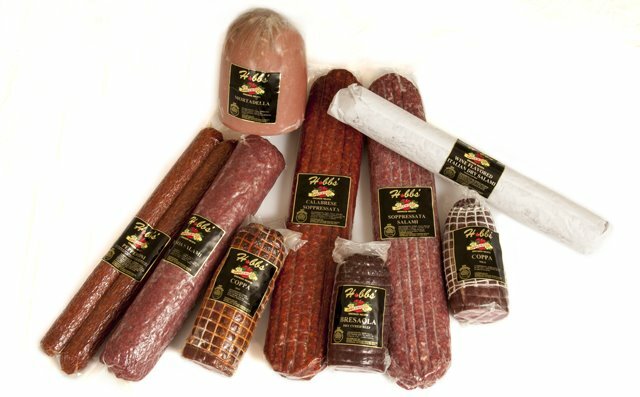 It has been aged to perfection and possesses a flavor typical of the best salami in the traditional flat shape. Coarsely ground, lightly seasoned, and enhanced with red pepper flakes. Slice it thin, and pair it with your favorite gourmet Italian cheese. Our Wine Dry Cured Italian Salami is carefully prepared, and aged patiently to enhance the traditional robust old country flavor and aroma.